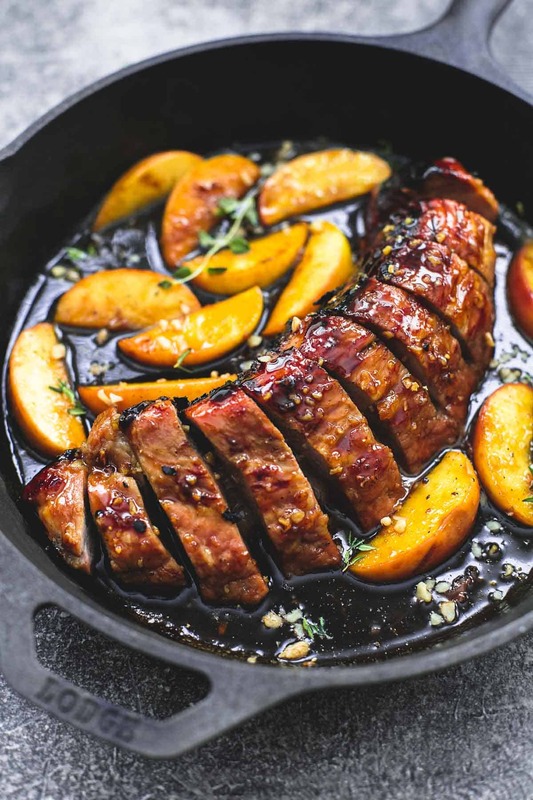 Easy and incredibly delicious one pan brown sugar pork & apples is quick to fix in less than 30 minutes and has wonderful fall flavors the whole family will love! This dish. I repeat: THIS. DISH. It’s everything. Every single thing you could want for dinner tonight. quick —>less than 30 minutes! 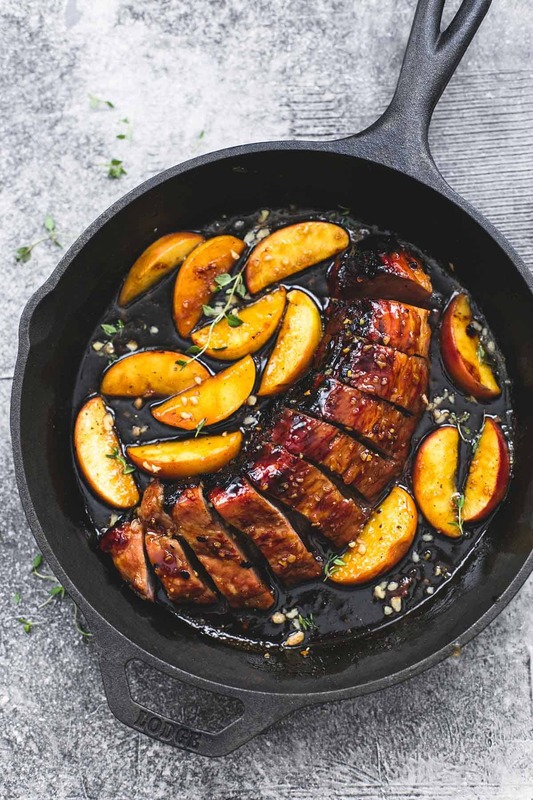 mega delicious —-> seriously though… that pork is incredibly juicy and flavorful. A quick brown sugar and garlic mixture is rubbed on the pork before you brown it in the pan and that is what gives this meat such incredible flavor. 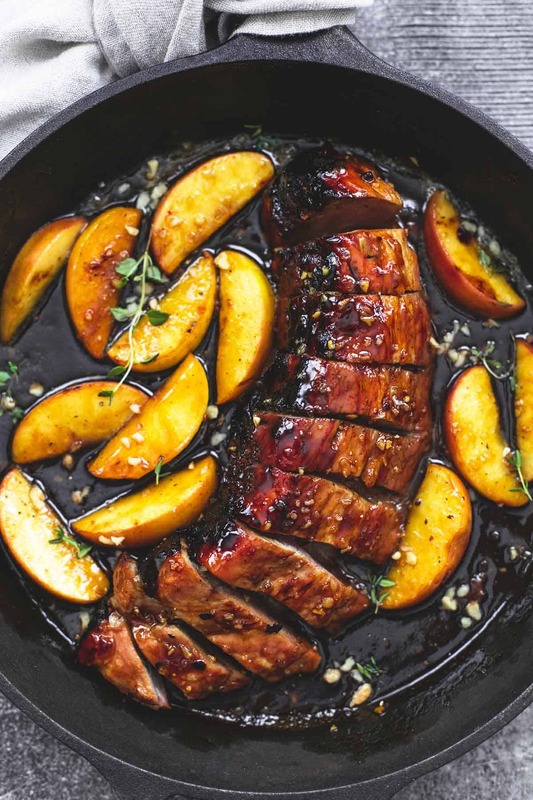 But it gets even better when you pair that juicy pork with tender, crunchy apples. Best part?? This dish is made ALL in one pan! And you know how I feel about one-pan dishes. Stir together brown sugar, dijon mustard, garlic, and apple juice. Rub mixture all over pork using your fingertips. Try these other 30 minute meals you'll love! I love reading all of your recipes. 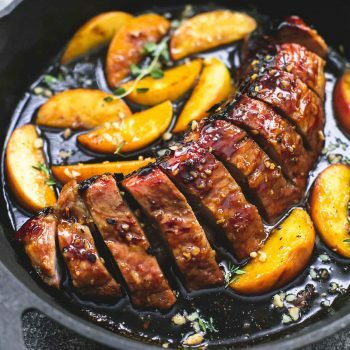 What type of apples would you recommend using for this recipe? Hi, do you think this would work just as well with pork chops ?? I made this last night with pork chops and it turned out really good. I was pleasantly surprised. It was tender and juicy. I will definitely make this again. Made this for dinner last night and it was fabulous! The picture looks so delicious! What would you recommend as a substitute for the Dijon mustard? Oh my, this was delicious! I accidentally added too much apple juice, so I just dumped it all into a bag with the pork and let it sit for about 30 mins before I cooked it. I put the meat in the cast iron skillet and cooked it for a couple of minutes before pouring the sauce over it. Otherwise, I followed the directions exactly. The apples (I used honeycrisp) tasted like they came out of an apple pie. Even my 11 month old loved the pork and apples. Great and very simple (yippy) recipe! I will be making this one again! Hello, I do have a question please. I am not sure from the recipe when did you cut the tenderloin into pieces? Did you cook it whole? and then cut it for the presentation ? Thank you in advance for answering. Any danger in using apple cider over juice? I’m afraid mine was a flop. I am unsure as to whether I was to cut into chops before or after which I did first as pictured. Getting the meat cooked with brown sugar sauce was not easy. I won’t be making ths one again. I made this recipe. The pork I used was some type of Applewood Bacon. And this was so delicious and so easy to make. It took me longer than the recipe suggests to get the meat cooked all the way through. I will definitely be making again! I made this recipe. The pork I used was some type of Applewood Bacon pork. It was so delicious and so easy to make. The only thing was that it took longer for mine to cook then the recipe suggests. I will definitely be making this again! This was delicious, easy and will be great for company. Already a favorite recipe! Do you slice the pork loin before you cook it in the skillet or once it is done? I am concerned about the meat not getting done all the way in the 10-15 min cook time. Thanks! 🙂 I cannot wait to try this recipe! Did you slice the pork before cooking? Great recipe except don’t cook the pork until it is “white through.” It will be too dry. The necessary temp for safety is 160 which will result in slightly pink interior. The brown sugar sauce was bUrning in my pan, so i quickly fried all sides and put it in the oveN for 1/2 or so. I may not be able to save it. I should have known better, but was anxious to try. Sugary marinates burn. Sure- if that is what you have on hand!! Hi Nicole- not exactly sure if you’re referring to the thick rub mixture as the marinade? But if so, you use all of the mixture on the pork and then put it in the pan! Hopefully this helps! Hi Tiffany, I made this dish couple of days ago turned out fantastic,took little longer than stated time but worth the wait, it’s now my husband’s favourite dish. I used some dessert apples given to me from my NEIGHBOUR’S tree. Thank you. the flavor profile Is amazing but the sugar burned and the pork had to be finished in the oven. Guess i’ll sear and bake next time. Thanks for your feedback, Shawley! What did you do For side dishes? Hi! Should I INcrease the amount of incredients if I’m more towards the 3lb range of meat? Hi Amanda- no, you will be fine with what is listed! The recipe is for a 1 1/2-3 lbs of meat! This was amazing!!! I used grey poupon country dijon mustard and substituted apple cider vinegar in place of the juice to add more flavor. The combination was amazing!!! This is Madeline from the Core Orchards team. We are a nonprofit in Michigan that has started the first U-Pick apple orchard in Detroit city limits. We are making it our social media “New Year’s Resolution” to post a tasty apple recipe every week. I am a personal fan of your blog and this recipe, so I wanted to see if you would be interested in having this featured on our instagram. If so, let me know which images you would like us to use and any highlights you want shared! Hi Madeline- thanks for reaching out! Go ahead and use any of the images on this page with a link back of course! Thanks!